Five years has passed since the release of "Un Dia" in 2008 and Juana Molina confessed in a recent interview that she barely knows what she actually did in the meantime. What we do know however is that she toured with David Byrne and Feist, she worked with the likes of Vetiver and Vashti Bunyan and she was involved with the Belgian record label Crammed Discs collective project Congotronics vs Rockers. She also toured Europe and Japan within the framework of this project : 20 musicians on the scene including Konono N°1, Kasai Allstars, Deerhoof, Wildbirds & Peacedrums, Skeletons and even Belgian funny band Hoquets for the Brussels gig (of which Juana Molina was the indisputable and charming MC). She also subsequently signed a record deal with Crammed Discs, which took over her last five records onto their catalogue from Domino. Oh, and she bought an electric guitar : a Gibson SG. "Wed 21" represents a step further into Juana Molina's aesthetics and her brand new electric guitar brought with it some renewed inspiration. Still, this sixth album isn't a departure from the songstress' previous recordings, it is more an extension of them. A parallel could be drawn with Bob Dylan's passage to electricity in the mid-60s before recording "Highway 61 Revisited", Dylan's songs became sonically more rock while retaining its folk idioms. Although, don't expect our Argentinean Lady to roll on 4/4 time signature and stripped back guitars, bass and drums instrumentation, this is a Juana Molina's album and the introduction of the electric guitar is just one added element to her even more extended sound panorama, a new ingredient however that pushes the artist towards more aggressive and contrasted territories. Therefore "Wed 21" sounds more direct, apparently simpler, more varied, Molina's is back to the shorter song format as well, but the most striking part : all tracks but one, "Las Edades", are uptempo, with some calmer moments here and there. One of the most surprising song is "La Rata", with its low coldwavy bass introduction quickly livened with a near post-punkish guitar riff and a massive stomping bass drum, it is not far off some of the heaviest songs by a past Crammed Discs' band, Minimal Compact, without sounding anything 80s. Molina's trademark multi-layered vocals and various percussion soon lead us back to more familiar ambiance. Another shock comes with the astonishingly robotik title track, the metallic rattles, techno-like bumping bass drum and buzzing repetitive electronic lines running all through the song make it sound like Juana Molina is backed by a tamer Liars. Sure her trademark polyrhythmic vocals and percussion remain to the fore, but still. "Bicho Auto" and its deep vibrating analog synth line complemented with a mix of metallic and latin percussion lies somewhere between Suicide, which would have gone exotic, and Finnish psych-pop luminaries 22-Pistepirkko. And then, the everything-in-the-kitchen-sink approach of "El Oso De La Guarda", also the longest track getting over the six-minute mark, agglomerates in one single track Molina's stupefying musical imagination, which perches more than once on the verge of insanity. Between its cartoonesque pursuit of an intro and its outro made of multi-layered sine waves and a creaking door, this song contrasts frenetic percussive noise, shimmering guitars and shamanic chants for a mesmerizing experience. Juana Molina's musical shyness and introversion are something of the past. From album to album, the evolution hasn't looked too striking indeed but try a listen to "Tres Cosas", for instance, then immediately follow it up with "Wed 21", while both records are undoubtedly hers, there is a real metamorphosis going on there, that of a slow moving caterpillar transforming into a whirling butterfly. Even at its poppiest moments, like on both singles, the compelling "Eras", with its clever vocal hooks, funky refrain and easily foot-tapping beat, and the more tribal little creepy "Sin Guia, No", with its knitting guitars and ecstatic chants, or the fast-paced almost ska-lead acoustic guitar jollity "Final Feliz" and the slightly Dan Deacon-esque rolled drums fantasy "Lo Decidi Yo", the album remains a pretty challenging and rewarding listen throughout. Juana Molina has succeeded with "Wed 21" where St. Vincent failed on her latest own, while the former mainly expended on her sonic palette to feed the content of her composition, the latter mixed up form and content to deliver clever sounding music from which most of the soul has been digitally sucked out. This is the fifth brilliant album in a row from Juana Molina, and her lately wider coverage all over the world, even in the monolingual protectionist US - remember all songs are sung in Spanish, with the exception of the English sung call-and-response refrain in "Eras" - is all the most deserved for an artist who is that persevering, bright, inventive and uniquely imaginative. And yet, with Molina's choice to electrify her music and push the polyrhythmic beats more to the front, her music became somewhat easier to reference with other artists, it all sounds slightly more familiar, more marketable, a little fancier. 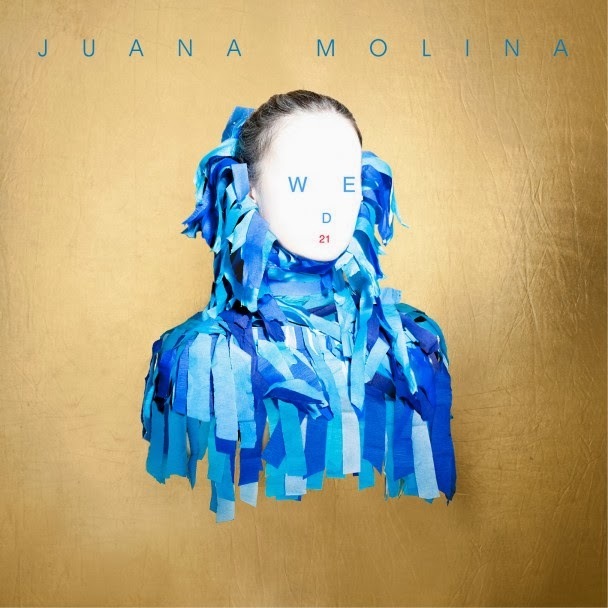 Almost 14 years after Juana Molina gave a first little masterpiece "Segundo", the world has finally caught up and she is now widely recognized as some musical genius. Better late than never.